Eliminate electrical noise with a high-quality guitar cable. 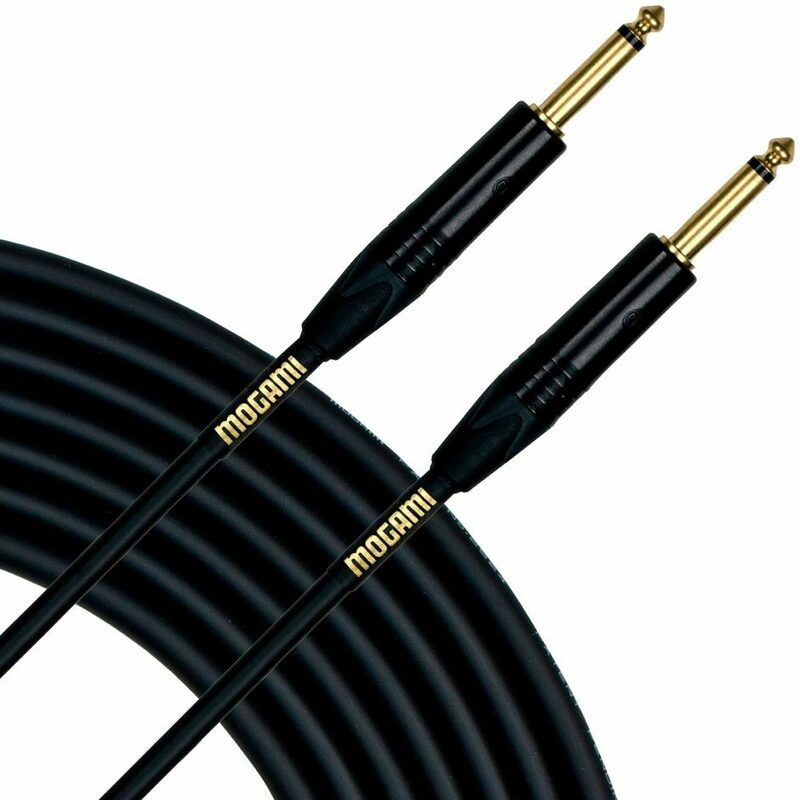 The Mogami Gold Instrument Cable is a studio standard. Sound: I am a studio session bassist in NC, and I can say that this cable has given me the best signal for recording than any other cable I've used, including Elixir and Monster. Clean signal, dead quite. This is what a cable should be. Ease of Use: Its a cable... It doesn't get much easier to use... =D Quality: Built rock solid. I gig with this cable both in the studio and playing live gigs. Value: It is what it is... I'm not going to say that paying $50+ for a cable is a good value for the everyday guitarist/bassist playing in a band somewhere in the world. However, the clear tone and clean signal this cable provides for recording musicians is good. Manufacturer Support: I have not had to reach out to Mogami for support, so I did not rate this section. The Wow Factor: Seeing how most of what I play is in the studio, I have wanted a Mogami cable for a while. I have been using my Mogami for about 4 months now, and I am very happy with it. Overall: Buy this cable if you are going to record. This may be too expensive to use for regular gigging. Besides, your tone playing live is different than when recorded because you have to EQ for the room. Therefore, a less expensive cable should be fine for playing live gigs. Overall: These cables are well built, very sturdy metal where the cable meets the TS connection. They have cut down on noise/hum from my 50s single coils noticeably so I would especially recommend them for single coil and tube amp guys. I play a Strat through a HotrodIII and these cables I feel preserve all your tone and dynamics perfectly. Sound: my friend brought this over for me to test out. excellent sound quality. goes amazingly well with my black beauty and marshall dfx. Feature: what can i say? its a beautiful thing. Quality: it is remarkably sturdy and resistant to ripping. Value: the only shortcoming of this product is the price. although the overall quality is great, i've seen only high prices. Manufacturer Support: mogami. what else can i say? The Wow Factor: this is an amazing cable for beginners and advanced players alike. Overall: although a little on the pricey side, this cable is excellent. i highly reccomend it. Sound: I decided to pay for the best, and I am very happy with the quality of the product as well as the price from ZZ Sounds. Value: Value was great due to ZZ Sounds willingness to work with me on price. Sound: It's a guitar cable...I had been using Monster Cables and learned that they expand the 1/4" input jack on my basses and guitars. Not by much but enough that I noticed when and if I had to use another brand that had a miniscule difference in size...I had experienced a popping if there was any stress on the jack and inputs. So I decided to try and find the best cable...both for sound and peformance and reliability for stage and studio. Mogami's name got me to spend the extra money they charge for their cable. I deserved it I thought...I bought a Gold 18' I think it was. I learned on the first gig that it would pop from what I later learned was the expanded 1/4" jack from the stretching of the jack from the Monster Cable jack....I contacted the Mogami people to ask about the popping and the rep got back to me a few days later and admitted there seemed to be issues with the Monster Cable jack expanding issues and that I should get the Mogami Platinum (which he offered up to trade out with me if I sent in the Gold Mogami cable) instead. So, I got the Platinum from the rep....did not really notice any sonic differences. The Platinum lasted about a month before it started crapping out onstage. The Mogami people told me I must be stepping on the cable onstage and that it was sensitive and it shouldn't be stepped on. lol...if it's a stage cable, it's gonna get stepped...things will be set on it. The Mogami rep offered up looking at the expensive Platinum but didn't return my call after that. For the money...I'd say, heat up your soldiering iron...buy some bulk Canare and some nice Neutrik ends and take a day off making a few cables and save the money. 8 of 13 people (61.54%) found this review helpful. Did you?